« Fishing on my Birthday! Only a fishing dad would ever understand the thought I’m going to express in this blog. My son likes fishing. l love and always have loved fishing. He is not as “into it” as I ever was. You know you have a fishing addiction when you can fish all day and night and the next day and the day after that your thoughts are only, when can I go again. This describes me and those that are like me and LOVE fishing. If you don’t get it, don’t try to. It is a passion that I cannot explain. I have always taken my son out as much as he would allow me. Wife is also over-protective – these trips need to be documented with a US Coast Guard trip planner and check in calls to the boss for confirmation that not a hair on this boys head is bothered in any ways shape or form. So you see there is a layer of politics (ok, she calls it love) that I need to always deal with. So anytime I get with him on the water – I cherish. Any experience we share -I cherish. I have fished with a lot of friends and very fond of our trips together however; this person is special – he is my son, best friend, and fishing buddy (even if he is not as “into it” as me). After a good hard skunking on a striper fishing trip last night, I needed to rinse the boat after her salty excursion and trailer this morning. Took the boy out with me for this and made a few casts. Within about 5 minutes his drag is screaming and he is all smiles and excited as could be. I coached him as I always do to keep the rod tip up, keep the line away from the motor, and to go easy on him. He did all of this and I know we shared a proud moment that we will never forget. He always likes to catch fish and who doesn’t? What he did next was kind of cool though and capture my heart in a way that I never would have predicted. We bumped the trolling motor into high speed to hit a cove that we know has some good largemouth. When we got there, I quickly spotted a carp that must of pushed the 20 pound mark. I gave him my sunglasses and he was very excited. He instantly casted to this big fish and spooked him but I consulted with him that, “carp don’t like senkos son, they like doughballs made from bread”. Manning the trolling motor I turned the boat and nearly slipped on some of the items that my son was emptying from the cooler. I asked him what he was doing. He replied, “looking for the sandwiches that mom put in here”. Nope, no sandwiches. He then took a cookie and told me that this should work. He saw her make them and it has flour in it, same as bread. Too funny. But the ambition and effort that he was applying to want to catch this fish that we saw was outstanding. Reminded me of myself when I was his age wanting to catch everything that swims. We did try to catch the carp after a few casts with his cookie, but did not land a fish with it. Point being that it was AWESOME to see him so “into it” and have such a great time with him. 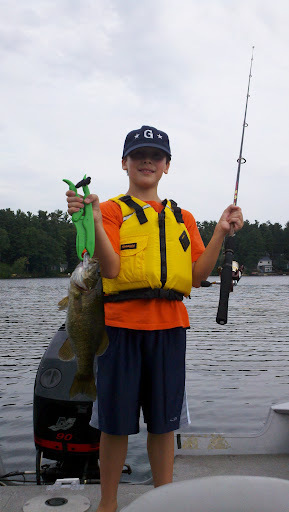 This entry was posted on	August 27, 2011 at 7:13 pm	and is filed under Freshwater Fishing Trips.